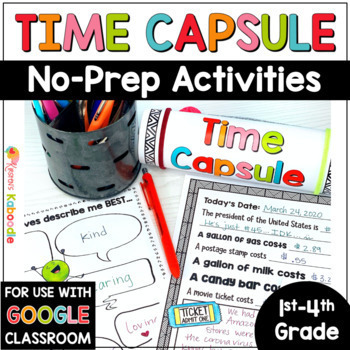 This Time Capsule Activity is perfect for All About Me activities at the beginning of the year, the end of the year, or New Year's Eve activities, as it provides everything you need for a snapshot of your student's lives! 1. 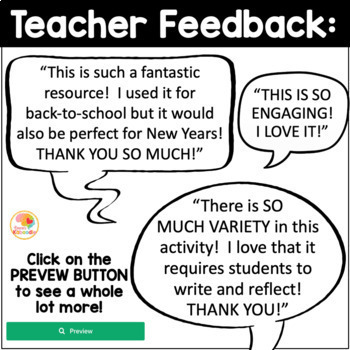 Use this packet as a beginning of the year or end of the year ALL ABOUT ME or TIME CAPSULE unit. *Each student can make a book and use the ALL ABOUT ME or TIME CAPSULE cover. *Pick and choose which pages to use at different times during the year. *Use the printables at Literacy Stations as they fit into your lessons. *Use the completed booklet as Mother’s Day or Father’s Day gifts from students. 2. Use this packet as a TIME CAPSULE activity. *Each student can make a book and use the TIME CAPSULE cover. 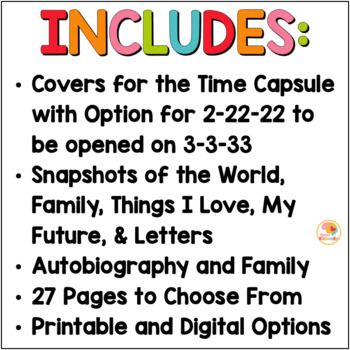 *Pick and choose which pages to use for the time capsule as a long-term activity. *Roll up the pages and place them in a canister (Pringles canisters covered in paper work well) for a time capsule container. *Establish the length of time students should wait to reopen their time capsule.